Out of the blue I’ve had a fashion epiphany. It happened with an innocent enough request from Chico’s. Well, hey, Chico’s, you had me at Comfort Waist. Yes, I’ll do it! I signed on to create an outfit that had Brenda stamped all over it using Chico’s products. I like Chico’s. I already own and wear pieces from Chico’s. I’ve got this! 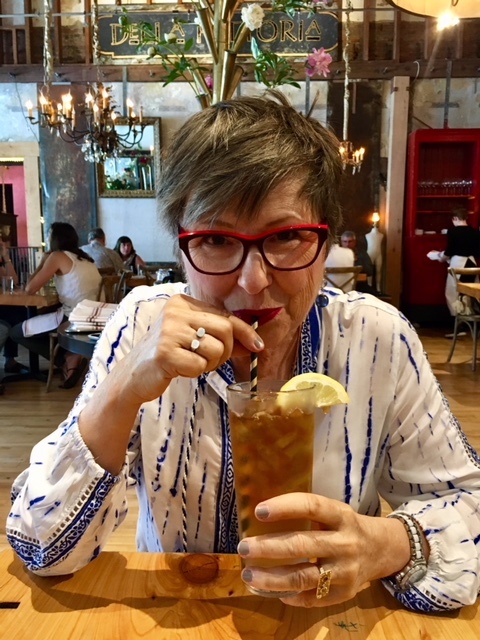 After the pieces arrived and I tried them on, I nearly called them back and said, “I can’t do it!” This was forcing me to challenge two styling narratives I participate in every day both personally and professionally. Chico’s had been straight with me all along. They hadn’t said, “Choose three pieces and put a look together.” No, they said choose a pant and a coordinated top. One plus one equals two. Two pieces. That’s generous by all standards but I’d forgotten to take into account how I rely on three pieces to look put together. Let’s talk pieces. If you’ve been around me, either as a reader or a client, you know that I’m a three-piece girl. I’m an expert at taking the same 3-piece formula for dressing that we used in the 1980s and applying it to current fashion. You remember that 3-piece formula. 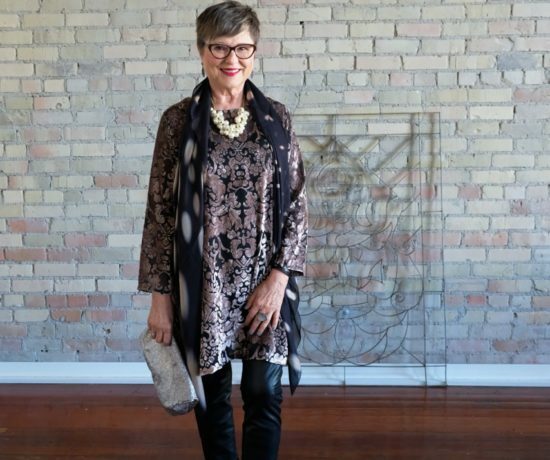 A skirt, silk blouse, and jacket. 1-2-3. A pant, knit shell, and jacket. 1-2-3. Three pieces completed your fashion sentence. Two pieces in a fashion sentence would have been like dangling participles, an incomplete look that didn’t exude confidence or style finesse. While three-piece suiting is pretty much a thing of the past, I can still keep the formula alive. I’m fashionably altruistic like that. I just wrote about this in a recent blog post: The power of the third piece to finish an outfit. I live by this formula and here I was about to create an outfit using two pieces instead of three and I felt nearly naked. Could I still be me in two pieces? I’ve been called the Iron Chef of Fashion. When someone calls me that, like a client after I’ve put together twenty new outfits out of the clothes she already owns, I don’t protest. I don’t even pretend to protest. I so own this title that you could put it on my tombstone and I’d be fine: Here lies Brenda Kinsel, the Iron Chef of Fashion. When I pull out my iron chef fashion tools, I’m generally not working with coordinated pieces. That would be too easy. The top chefs I’m thinking about are into the razzle-dazzle moves. I have some of those moves myself. 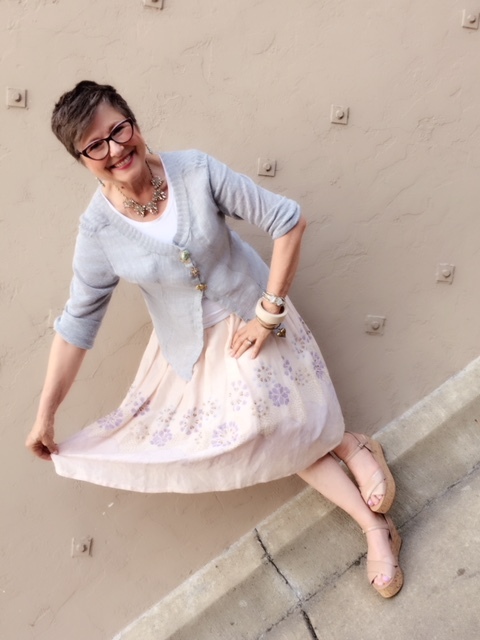 I make stylish outfits out of stragglers, neglected items at the back of the closet, has-beens headed for Goodwill, clothes purchased three years ago with tags still attached. I can throw disparate ingredients together and come up with delectable combos my client will wear over the next four weeks while earning compliments. Then I get up the next morning and do it all over again at someone else’s house. I’m consistent like that. BK wondering, Can I admit to my readers that I’d digging this coordinated look? With that Iron Chef of Fashion reputation, would wearing a coordinated top with a pant destroy my rasion d’être? 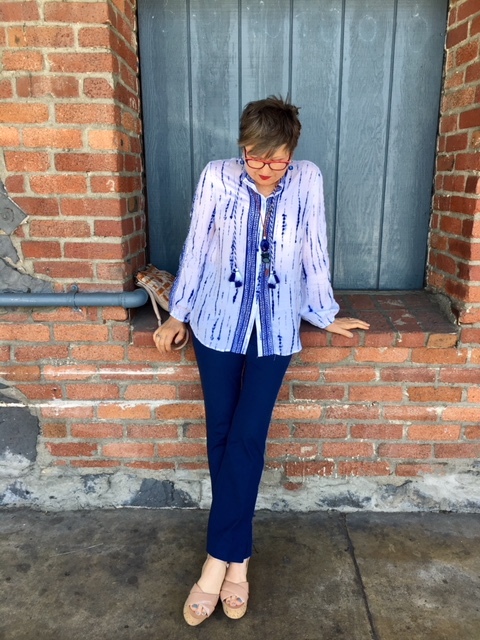 These are the pieces I chose: Tonga navy comfort waist pants, a coordinated embroidered boho shirt, a blue stone pendant on a tan leather cord, and blue bauble earrings. I prepared for the big day when I’d debut this outfit. I started with the easy part. I slipped into the pant. Besides being comfortable (that hidden waist thing really works) they are my favorite shape. They make me look long and lean. If you didn’t know I was 5’5″, you might think I was 5’6″. I put on the boho shirt. Gosh I love the contrast of the white and blue together! I thought I’d feel naked without a third piece but I didn’t! I mean it’s not a crop top, it’s a long top. Why was I so afraid? I added my boho-ish woven leather bag to my outfit. I like the way the caramel color in the bag relates to the color of the cord on my necklace. And I like how the necklace just adds texture to the top. There’s something very relaxed going on here! I’ve been telling myself that I want to slow down to the speed of life. I got an inkling of what that felt like while wearing this easy, breezy, coordinated non-three-piece outfit. It seemed like the outfit was bringing out my wishes. I’ve been thinking about getting out my sheet music and playing piano again. Seeing that piano in Petaluma was a nice reminder! I feel lucky to have enjoyed every minute of lunch that Tuesday with my daughter Caitlin at Della Fattoria. How glorious is it that? I love how strong and spritely I feel walking around town in pants that make moving around feel effortless. Moving around feels so right! So Chico’s, thanks. I didn’t realize I was going to have an epiphany but I did! I’ve always focused on how the right clothes can help people reach their goals. Being in this outfit helped me realize a softer type of goal I have in this chapter of my life. It’s about chilling and having time on my hands to fill with willy nilly things. They aren’t those grand, big goals that are perhaps easier to measure. Yet I can consciously dress for these softer goals. Two piece dressing may be one way to do that. So my friends, two pieces or three? Do certain combos make you feel a certain way? Are you trying new things and getting new results? Let’s hear about it! Brenda you look luminous in that outfit. I think the shoes can be the third, contrasting, piece. Fantastic, style and comfort combined! I love it! The blue and white looks great on you and I love the pants, I think you styled it out of the ballpark! And it’s ok to wear two pieces instead of three. The jewelry and shoes count and plus it’s summer. And well, I just love this whole outfit! I’ll quit gushing now ! It looks definitely more casual w/o the third piece, but sometimes that’s a nice change, right? This made me feel vindicated in usually wearing two pieces in hot S. FL weather! Love it! You look great, as always. You had me at Navy blue! In summer weather I’m more likely to wear 2 pieces. Summer in Maryland is too sultry for additional layers. I don’t see these pants on Chico’s web site; can you provided more info? 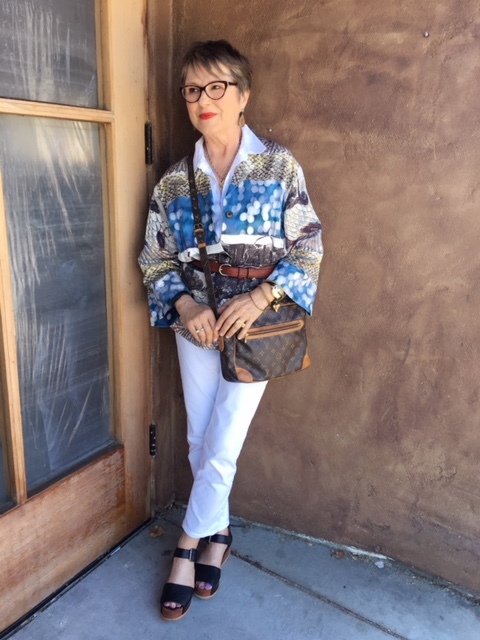 Summer in southern New Mexico would be deadly in 3 piece combos, so I’m always on the hunt for stylish outfits that are as light as possible this time of year. This one from Chicos is a homerun, Brenda. Looks great, protects from the sun and wouldn’t bake me! I guess the “never say never” mantra would apply in this case. I think this is a good look. I am in a hot climate, so often my necklace is the “3rd element” which seems to work here. 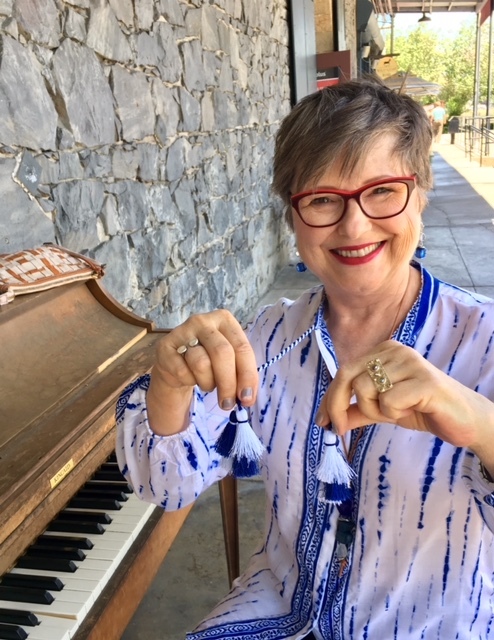 When it gets too hot for a necklace, I have some lighter and leather corded ones. I like seeing you slightly out of your comfort zone, well done! I know exactly what you’re saying, Brenda!! But especially in the summer, there are times that 2 pieces can be enough. Especially when the top is so fun and interesting!!! Like Alice Webb said. Humidity and heat in southwestern Ontario often make three pieces impossible, so thanks for showing us how it’s done. I sooooo love this on you Brenda! That colour is perfect with so much white in it the blue is a gorgeous accent that draws the eye up and down. You do look so very slim in that. That is the length that I like when I wear the comfort waist band pants. Everything works in the heat, just slip it on and go with covered arms as well. Perfect. As Susan said, the heat and humidity in S.W Ontario this past week was a killer and that top would have been great. Wow! You look fabulous in that 2-piece outfit!! The pants are so slimming!! Love how u coordinated with the tan! And love the top! You did it!! How about just ONE PIECE THAT GOOD OLD CAFTAN!!!!!!!!!? YOU LOOK SMASHING IN TWO BITS!Plus, that BLUE is a very pretty color on YOU! YOU can DO THIS AGAIN if CHICO’s likes what they SEE!!!!!!!!!!! Summer is definetly about less is more and you look amazing! Laurice, after reading comments left here about the outfit I have been thinking about it more too. And I believe it’s exactly as you said. There’s so much interest going on in the shirt that it does the job of two pieces! Spot on, once again, Laurice! Well, I’d be happy to wear any outfit that uses the words you just used! I always seem to need a little polish in my outfits. And I was happy with this mix. Sending you heaps of love from Sonoma! The same thing is happening to me as I begin to embrace a bit of boho style. 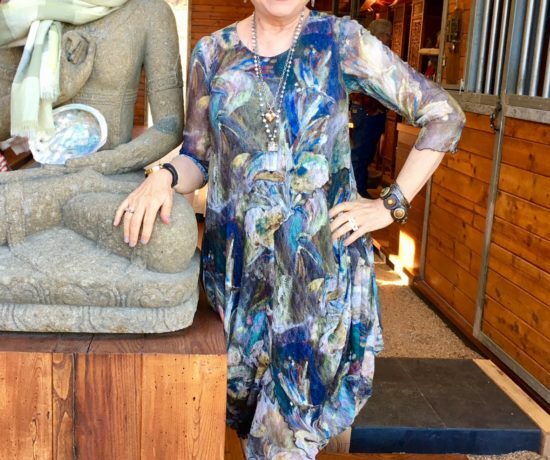 (Like there is anything else in the stores to buy ) Even though I lived happily and hiply through 1970s orginal boho style I was not excited about doing it again. But as I added a few boho tops to my wardrobe I found myself liking it. A lot. Just a top and some bottoms. A cool necklace or cuff. DONE. I know what you mean ! And I love your outfit! I think your handbag and necklace finished your 2 piece look perfectly ! Thanks Cynthia. You’re speaking to me as you describe how you’re working in some boho style. I never was a hippy per se. I however loved embroidering my jeans and making clothes for myself that involved different patchwork styles. But I am so thrilled about this boho top. And with the pant style that’s in my comfort zone I really feel like myself. I’m going to put my toe into those boho waters a little more! My third piece was actually in the car. It is a linen short Burberry trench coat-loose and lightweight. It would have added another shade of blue to my blue pieces and in a nice way. Hopefully I’ll get to wear this outfit and be able to wear the short linen trench! I don’t have a rule about the number of pieces. Winter will often be 3 pieces, just for comfort. In the heat of summer it will often be one piece: A dress! That 2-piece outfit you got is a winner – the shade of blue is particularly beautiful. Yes, I so love that shade of blue as well. And you’re right about the dress. Nothing’s cooler than that in summer! I’ve tried to convince some of my clients about that, ones who are dress resistant but hate the heat. What a delightfully humorous post! You look great in that outfit; good choices. Thanks Angie! I much appreciate you! 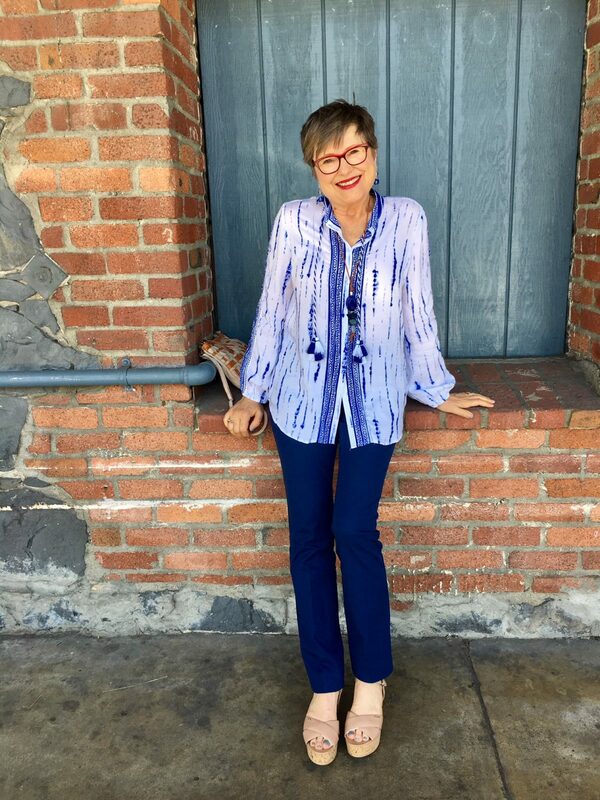 I love this fresh and stylish outfit – you look relaxed, comfortable and cool! I was beginning to feel that what I wear is insufficiently stylish. This post me feel so much better about how I dress since I live in a hot climate and that third piece is often so very difficult to add. Thank you for your brave and honest post! Oh, Kay, I’m so happy to read your comment! I’m glad I could dispel your thoughts of looking insufficiently stylish. I promise to post more two-piece outfits. And remember, I learn from you guys who live in that heat like you do. I do too in summer although if I drive to San Francisco the temps drop by 20 degrees so I always feel in-between seasons here in the Bay Area. I’m a three piece dresser like you, Brenda, especially for work. Two pieces does feel a little …unfinished! It’s a huge hurdle to dress for work here in the Midwest during the summer. 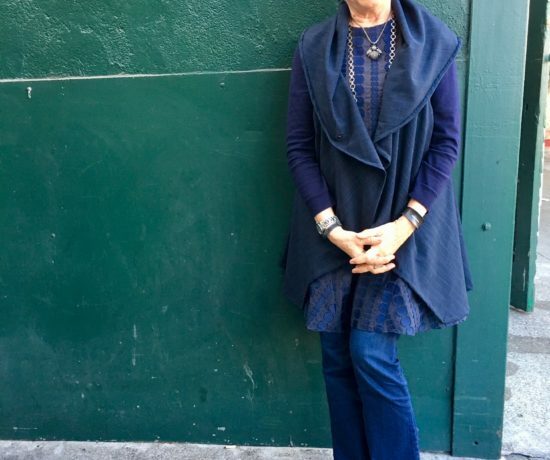 Love this look on you, and I can see a change in my future ….need to look at the pants. I have a love/hate relationship with Chicos due to fabrications. 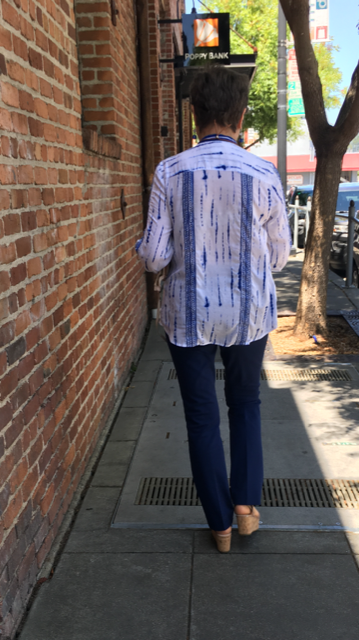 I’ll look again because of how nice the slacks look on you…. Do try these pants. I think you may fall in love! And I’m familiar with that Midwest weather you speak of. It is a challenge! Imagine my surprise when I saw you in this top which I recently purchased!! Paired it with mysterious blue “So Slimming Crops” and blue earrings which match perfectly. 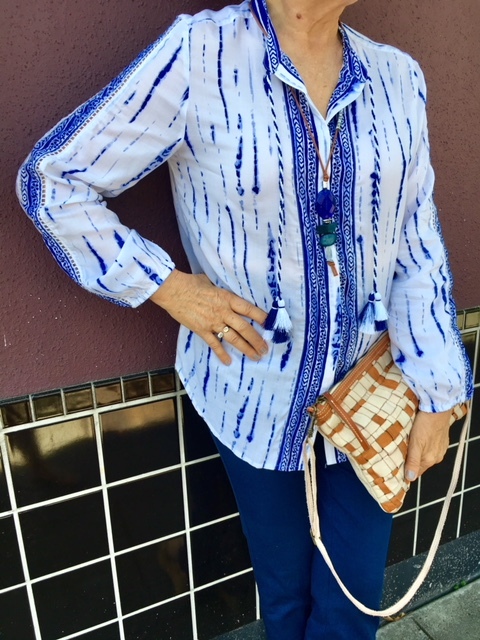 For the 3rd piece you could add a tank in the mysterious blue which I plan to wear either way, This top is very light and great for our So Tx HOT weather. Love the blue/white combo on you and me also. Cheers to Chico’s! Yes, indeed, cheers to Chico’s. Aren’t those pants insanely comfortable? You mean I could come and visit you in Texas because I have an outfit I could wear in your weather? I think your fabulous shoes count as the third piece here…. Good point, Evelin. I do feel that with two piece dressing the shoes have to “count” whereas in three-piece dressing, they don’t have to be standout. 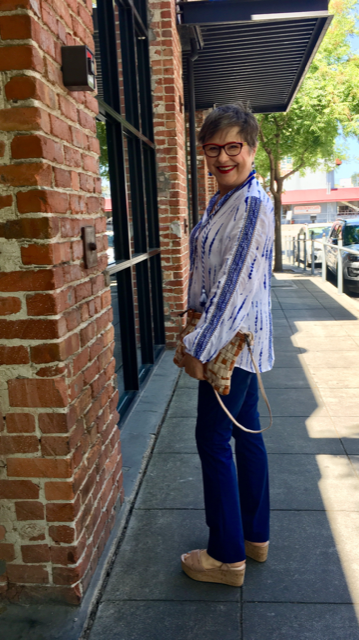 That’s an interesting thought – as I said earlier, I’m mostly a one-piece dresser in Summertime, but then I’m very careful about the shoes I wear and I like colored and unusual Summer shoes! Love that top and that color is gorgeous on you!! Thanks, Cindy. I really love the color too. Could be a new favorite! While travelling in Florida, I read your blog and fell in love with the top. Had to visit a few shops, before I finally found it at a Chico’s in Orlando and it’s in my Dutch wardrobe now. Thanks for the inspiration!